This is just one of the dozens of findings in our new research, Chatter Matters: the 2018 Word of Mouth Report. In this exclusive study, we surveyed 1,001 randomly sampled Americans to determine how we decide what to buy, and how to vote. Word of mouth—online and offline—impacts every business, organization, candidate, and cause. Word of mouth is, of course, the oldest form of recommendation and customer acquisition, and it may be more important than ever, according to our findings in this Chatter Matters report. When receiving a verbal recommendation from a friend or family member, 83% of Americans are subsequently more interested in purchasing the discussed product or service. And not only is word of mouth a powerful motivating force, it’s actually the preferred mechanism for information when Americans are making purchases. 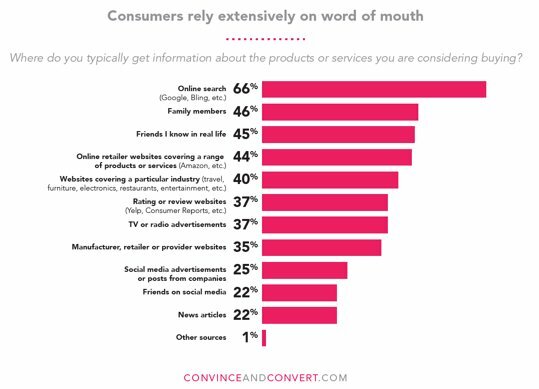 Among all Americans, word of mouth represents two of their three most popular sources of information when researching purchases (online search engines are the third). We also looked at how online and offline recommendations impact specific purchase types, as well as voting behavior in America. These are among the most important questions we set out to answer in Chatter Matters: The 2018 Word of Mouth Report. We found that on the whole, word of mouth is even more powerful and important than previously documented. In many situations, word of mouth is far more persuasive than advertising, and not by a small margin. But perhaps the most interesting aspect of word of mouth in 2018 is that its effects vary considerably based on purchase category and age. This Chatter Matters report specifically probed the importance of word of mouth to Generation Z, and compared the efficacy of online vs. offline recommendations. This report also looks at the impact of word of mouth, advertising, online research and other behaviors on voting patterns. Chatter Matters also examines the role and power of celebrity recommendations on purchase patterns, and the findings are fascinating. Can you guess who the most influential celebrity might be? We’ll be focusing on specific findings in series of articles and videos for the next few weeks, but you can download the entire report—at no cost—at any time at ChatterMatters.info. In addition to the Chatter Matters research, the team at Convince & Convert is working with multiple companies to analyze, craft, test, measure, and launch distinct word of mouth initiatives. The very best way to grow any business is for your customers to do it for you. 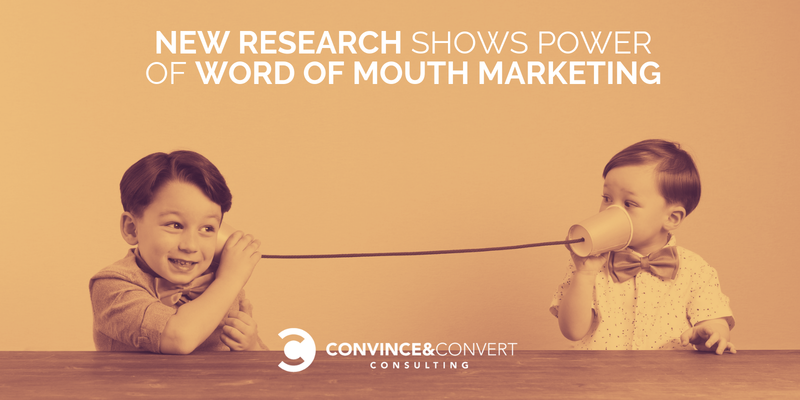 We know how important word of mouth is – and the Chatter Matters research underscores that fact. Yet, essentially NO company has a defined word of mouth strategy. We can fix that. If you want to do word of mouth on purpose, and use it to amplify the impact of your content marketing, social media marketing, customer experience, and traditional marketing and PR, let us know. This report was produced by Convince & Convert Consulting, working alongside the research firm Audience Audit. It examines the word of mouth attitudes of 1,001 randomly selected Americans. The margin of error on this report is approximately +/- 3.1%.